No two weddings are the same and neither are toastmasters! Peter is a caring professional toastmaster who offers a service specifically tailored to enhance your own special celebration. If you would like to know more about toastmasters, or Peter’s individual services, please contact him for a relaxed chat without any obligation. Trevor is a caring, attentive, professional amd committed toastmaster to ensure that your day is extra special and the greatest memory for everyone. Professional Toastmaster and M C at your service. I am a Professional Toastmaster and Master Of Ceremonies. I am based just outside London, and I am prepared to travel everywhere for my clients. I cater for all types of weddings. I will be delighted to help you. A professional toastmaster giving a professional service at your special event. Experienced expertise delivered with confidence, in style and good humour. In addition the art of Sabrage is offered. Adding a touch of class whatever the occasion. Cecil Wilson specialises in Weddings, but is also available for other functions in Northern Ireland and beyond. A Traditional Toastmaster looks forward to helping every Bride & her Groom enjoy their special day just that little bit more.A Toastmaster adds distinction to every special event ! No two weddings are the same and neither are toastmasters! 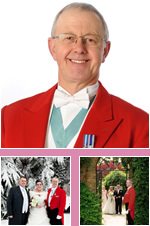 Peter is a caring professional toastmaster who offers an individual service tailored to your special celebration. Contact Peter now without obligation or pressure. We are Importers, Stockist & Suppliers of comprehensive range of Miniature & Deep Groove Ball Bearings having wide Application in the field of Electric Power Tools. Charge Your Glasses provide everything that you'll need for a brilliant wedding speech. Whether you are a Groom, you will get excellent speech along with proven tips. When you drop by our store, you will see it is specifically designed for children. We are friendly and accustomed to accomodate children.